We usually don’t sit at the dinner table unless we have guests over. It’s the couch, a napkin and dig in. 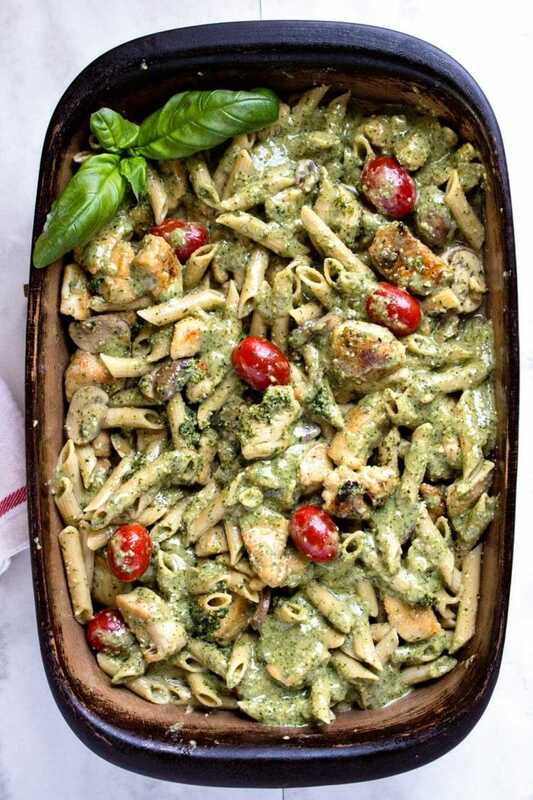 So typically the meals are such that a knife isn’t necessary, like for this Creamy Pesto Chicken Pasta. It’s one of our go-to favorites. Dave’s not a fan of tomatoes or red marinara sauce (I know, gasp! ), but pesto he likey. 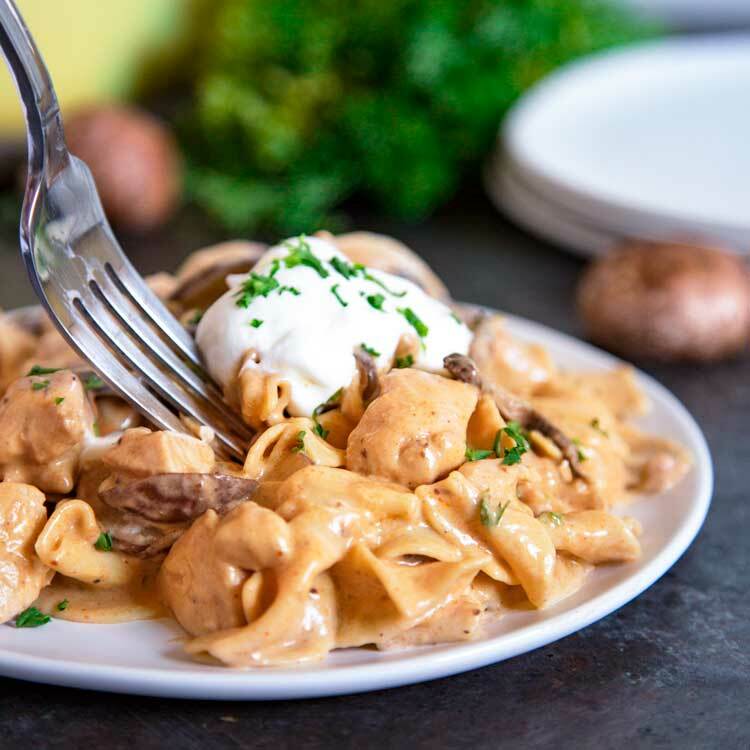 With some quickly browned chicken I cut into chunks, some sautéd mushrooms and onion, a simple deglaze of the pan with chicken stock, pesto and some cream are added to make a smooth sauce that smothers the pasta. Sound good? It’s sure to please and is quick to make. The other evening I made fresh pesto since the basil plant I had in the kitchen stayed alive, thanks to Les for watering it! Gratefully he house sat for us last week and kept the boys company. The aroma from the homemade pesto was so powerful. Fresh is always best to me, but feel free to grab some already made from the market. Sometimes I mix it up with the nuts I add, sometimes pine nuts other times walnut or cashew. The traditional pesto is used in this one with fresh basil, pine nuts, kosher salt, garlic, Parmesan cheese and olive oil. We ate out quite a bit last week in Maui and some meals at home that are familiar and comforting were definitely in order. I had mushrooms on hand and did a quick sauté of them with diced onion to make this an all-in-one meal. This isn’t a heavy alfredo sauce based dinner. 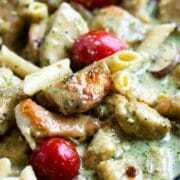 After deglazing the pan with chicken stock, which picks up all the sautéed bits and pieces of the browned chicken that were lightly floured, the sauce thickens and with the pesto and cream you have a killer, flavorful sauce to pour over or toss with cooked pasta and the chicken. I added some fresh little cherry tomatoes for me and this ended up being another satisfying dinner at home. 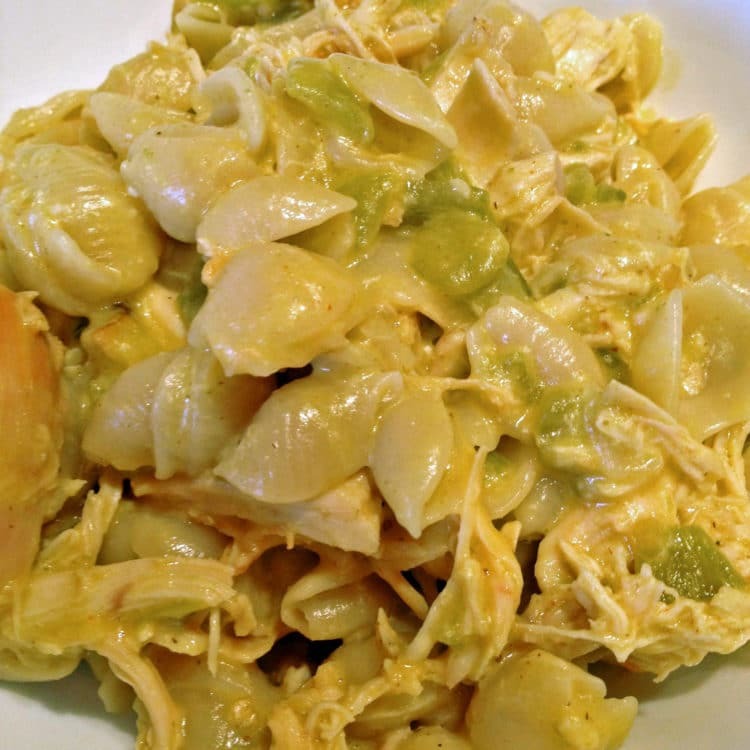 This is a great meal for four or double for a large group with salad. Speaking of doubling this for a large group, Dave had some guys coming over for dinner in a few days and asked this one to be the dinner. Hence most of these shots are in a 13×9″ baking dish. I wanted him to be able to re-heat this later when I was out. Otherwise this gets eaten right out of the skillet, fresh and hot! With the dogs Oliver and Kodi, some DVR’d shows and fresh figs for dessert, it was great to be home again. The fig tree is off the hook with ripening figs. More on them to come. Enjoy! 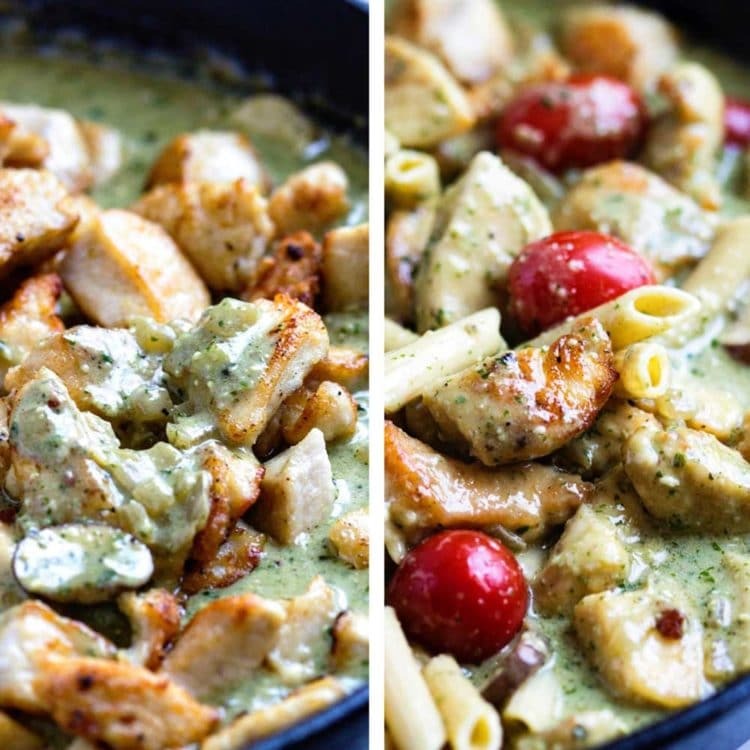 This Pesto Chicken Pasta has tender browned chicken in a creamy pesto sauce served with pasta and tomatoes. A delicious Italian inspired meal! Rinse and pat dry the chicken. 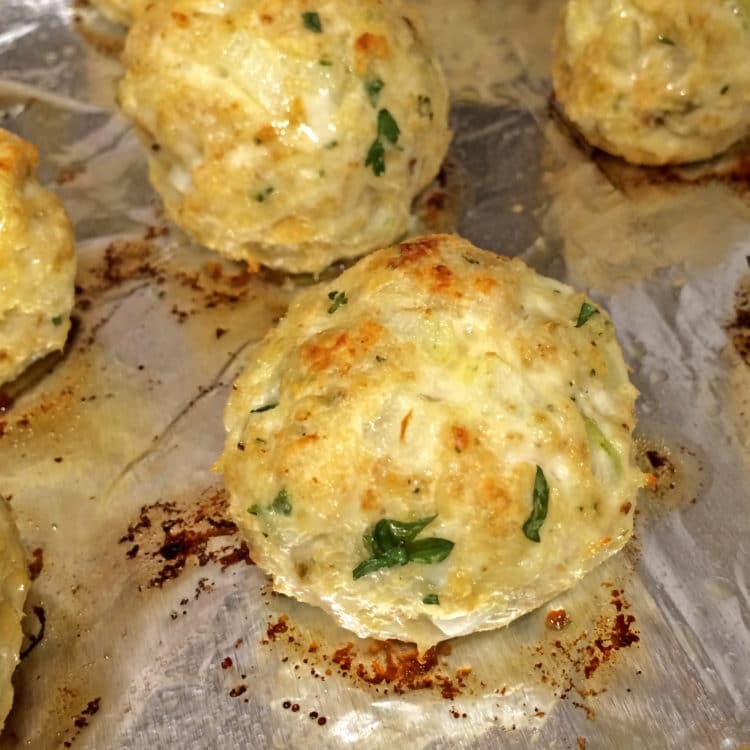 Cut into 1-inch pieces and toss with salt and flour to coat. In a large skillet over medium-high heat add the oil and sauté the chicken. Turn to brown on all sides. Add more oil if needed. Transfer to a platter and keep warm (See Note 1). Add the diced onion and sauté for two minutes. Add the sliced mushrooms and continue to cook for 3-4 minutes. Add the chicken stock and deglaze the pan by scrapping up bits of browned food on bottom of pan and bring to a boil. Add the pesto (reserving 2 tablespoons) and lower heat to simmer. Stir to incorporate and add the cream (See Note 2). Allow to reduce and thicken for several minutes. Add the chicken and platter juices back to the pan and toss to coat. Add the cooked pasta, tomatoes and stir. Serve warm with reserved pesto on top. 1. I place the platter in the microwave to stay warm, but don't turn it on. 2. 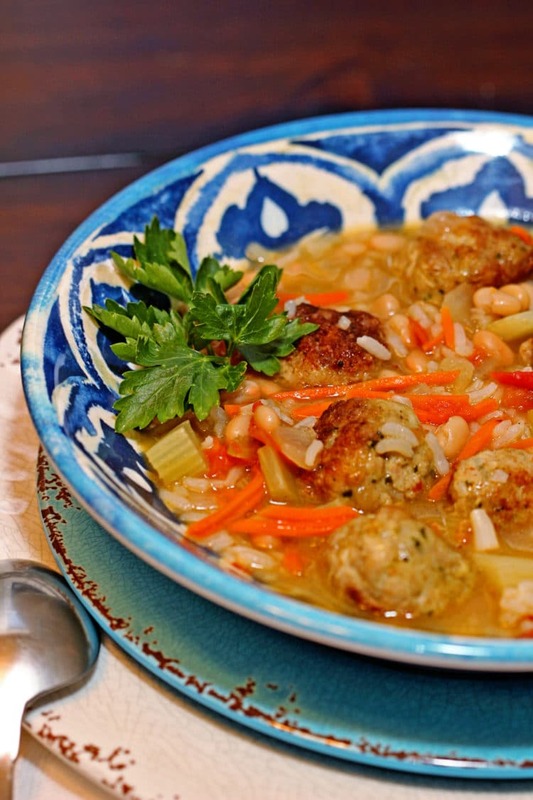 Adding the half cup of Parmesan cheese is optional, but adds a richness that's so good to the sauce. Is this something you could make ahead? This was DELISH!!! We loved it!!! Reading comments like this always make me smile! Thanks so much for coming back and letting me know Janet. Drooling over here! Looks delicious! 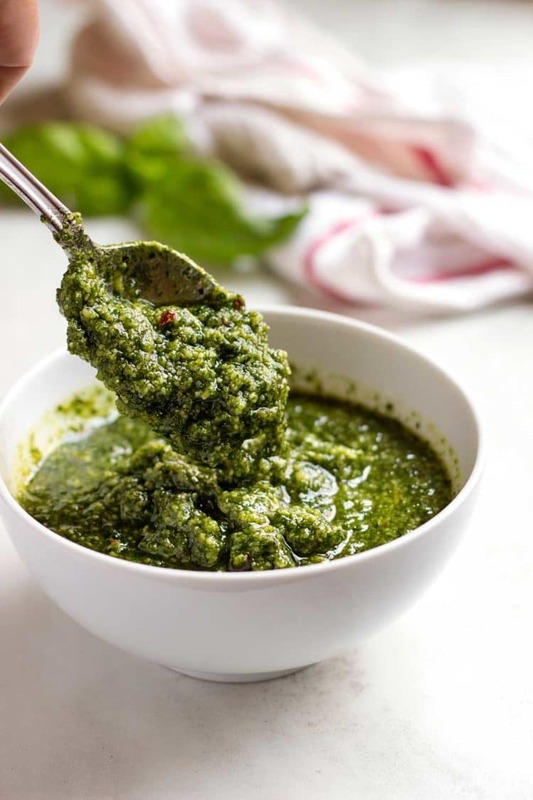 Creamy pesto… ooo la la! 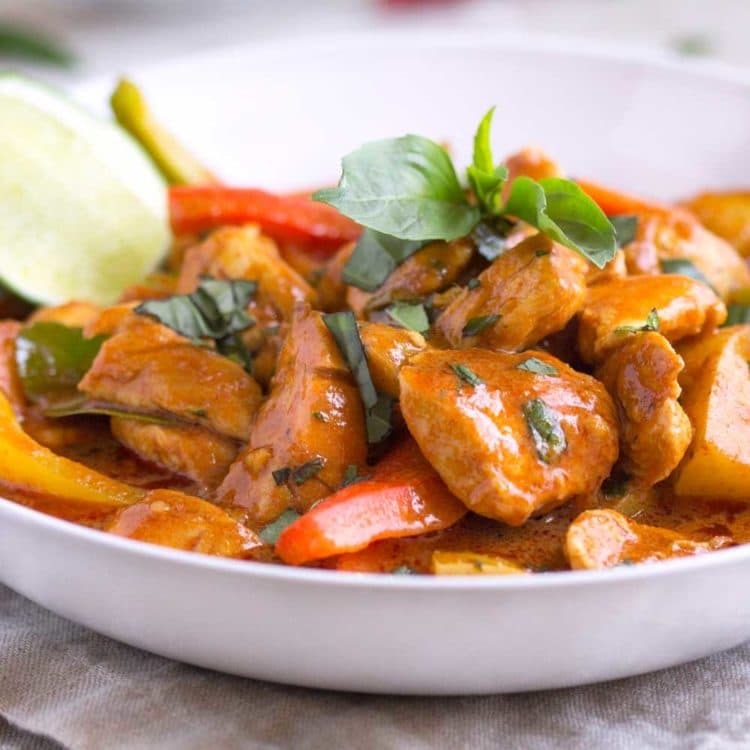 Going to try some of these delish chicken recipes! 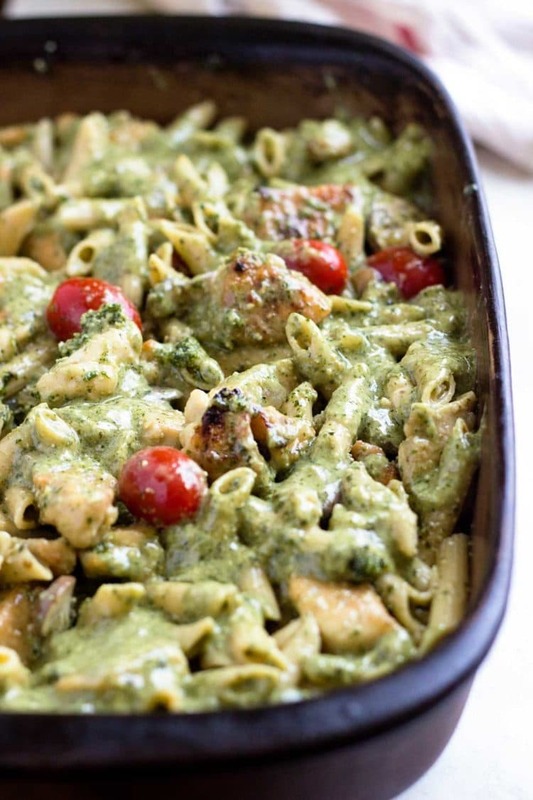 Thanks for stopping by, gotta love browned chicken and creamy pesto covered pasta, right?! Have a great weekend. I just find it difficult to sit on the couch and cut things so I cut and prep in the kitchen and sit and eat. No fuss! Thanks for stopping by Natasha! I can’t with that pesto picture! Okay – so this has all the things I love and the ‘couch, napkin and dig in’ is just the frosting on the cake! 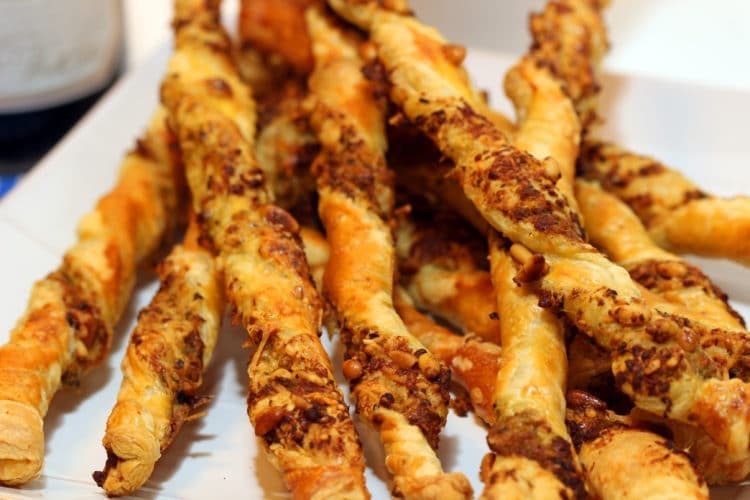 Wonderful recipe, yet again, my friend!! Thanks Annie! 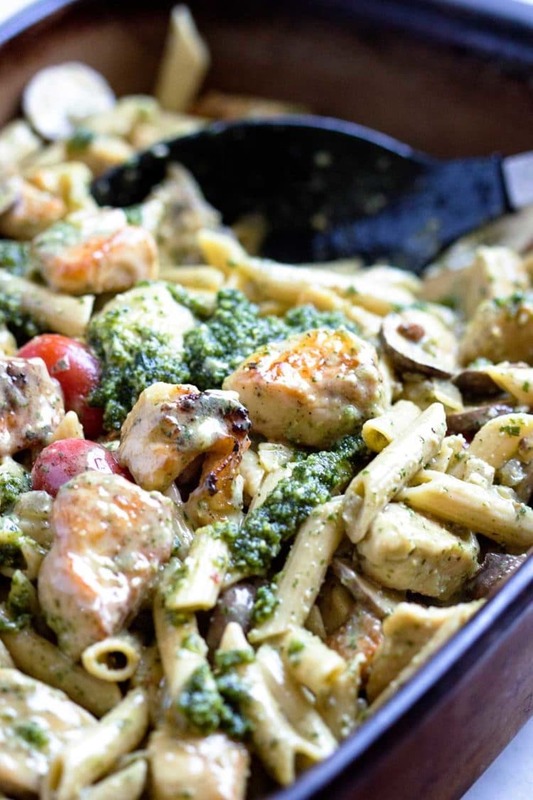 Can’t go wrong with pesto and chicken, right? You’re not going to hibernate on us are you?! I need to keep the pasta less and more grains here with Dave, but when I do it’s usually wheat pasta as it breaks down slower (with him being a Type II Diabetic). Fig recipes are in full test mode! Have a great Dorothy! Whaaaaaa?! Dave doesn’t like tomatoes or red marinara sauce? Gasp indeed! Sounds like my sister! It always just meant more for me! I’m glad he at least like pesto, because if he didn’t I would have to give him some shift eyed stares! 😉 This chicken pasta looks seriously scrumptious, Kevin! 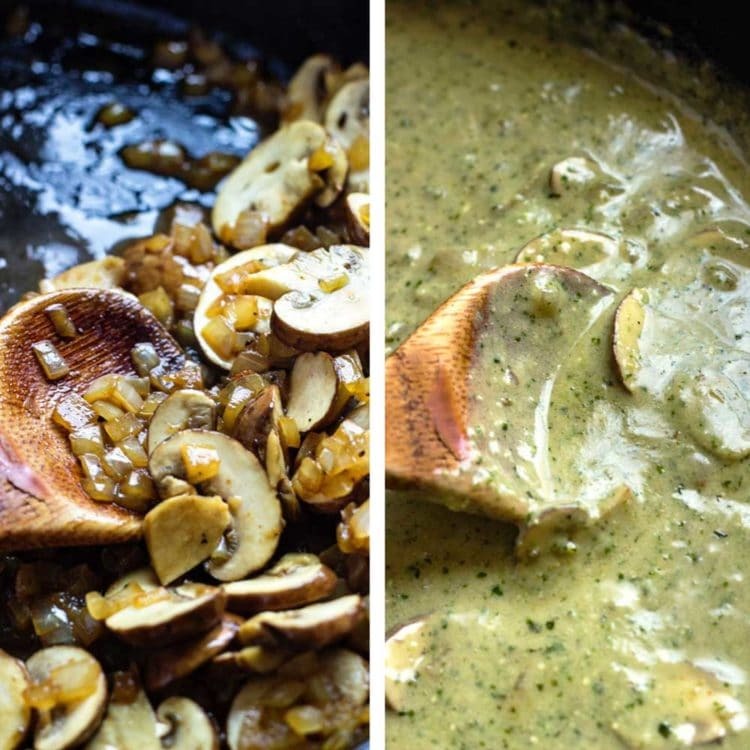 LOVE that thick and creamy pesto sauce! With a bit of sauteed ‘shrooms, tender chicken and tomatoes to boot – heaven! I’ll happily eat this at our kitchen counter — because we don’t do the table thing either. 😉 Cheers, buddy! YES! No garden for me as I have two 4 legged eating machines. Did I ever tell you they ate my 6 jalapeño plants once?! Pesto is that wonderful spread or sauce, perfect on so many things. Sadly the critters and birds love my fig tree too, so I need to grab them daily if I make it to the good ones first. 🙂 Wish we were neighbors Dawn!